Taking AREX is the cheapest way to go from Incheon Airport (both Terminal 1 or the new Terminal 2) to Seoul Station (fare: KRW8,000 (Book Online ). Having said that, if you are going to Myeong-dong, taking train and subway from Incheon International Airport to Myeong-dong is the second best choice because you need to change from AREX train to Subway Line 4 at Seoul Station. The best choice is still to take Bus 6015 (fare: KRW 10,000 = approx US$8.80) that takes you directly to Myeongdong. Before you continue reading, just be WARNED that taking train to Myeongdong is NOT advisable if you have to carry heavy luggage with you. You have to walk for about five minutes Seoul Station to change line from AREX train to Line 4 of Seoul Subway to get to Myeongdong Station. In addition, the subway station is deep underground. The stairs at subway stations are quite high and long to climb and the walkway could be bumpy for luggage too. Therefore, taking Bus 6015 is most convenient in most cases because it will take you directly to directly to Myeongdong without changing line or station. However, the bus route takes 1 hour 30 minutes while train route would typically take only 1 hour to 1 hour 15 minutes. Take the Airport Railway Express (AREX) train from Incheon International Airport Station to Seoul Station. At Seoul Station, change to LINE 4 of Seoul Metropolitan Subway to get to Myeong-dong, which is only 2 stations away from Seoul Station. Get off at Myeong-dong Station. NEWS UPDATE: Good news for passengers who use AREX to go to Myeongdong. From March 2015, a new passage from AREX platform to LINE 4 platform has been opened to make it easier for passengers who go to Myeongdong to change from AREX to LINE 4 of Seoul Metropolitan Subway . This new passage way has shorten transfer walking time from 15 minutes to a short 5 minutes. The one way ticket from Incheon Airport to AREX Seoul Station costs is KRW14,300 (approximately US$12.60). However, there is normally a special discount fare at KRW8,000 (airport counter price) or KRW7,330 (online price). From Seoul Station to Myeong-dong, the Subway ticket price is KRW1,250. In total, the fare from Incheon to Myeong-dong KRW9,250 (Approximately US$8.15). This is only less than KRW1000 (US$0.88)cheaper than using Bus 6015. How to buy AREX Ticket at Incheon International Airport? Before you proceed to buy the AREX Ticket, it is important to know that there are two types of train service from Incheon to Seoul. One is AREX which is the express non-stop train from airport to Seoul Station. The other one is the commuter train that stops at 10 stations before arriving at Seoul Station which will take more than 53 minutes. We recommend AREX train because it is more comfortable, provides spaces for luggage, free WiFi on board and has a restroom/toilet on board. At the Airport Train Information Centre at the Arrival Hall - Th information center is orange in color. The staff here can speak English well. At the Airport Railway station - from the Arrival Hall, follow the signage to go to the Airport Railway Station. The signage looks like below. At the station, you can buy the AREX train ticket from the vending machine. Four languages are available on this vending machine, which are Korean, English, Chinese and Japanese. If you prefer to buy over a counter, you can also get the ticket from the Information counter at the AREX Station. Once you have gotten your ticket, getting onto the train is straight forward. Don't forget that there is an Information counter at the station if you have any question. The first AREX train departs from the Incheon International Airport AREX Station to AREX Seoul Station at 5:30am in the morning. The last AREX train to depart from Incheon International Airport is 9:30pm in the evening. The journey from Incheon Airport to AREX Seoul Station is 43 minutes. This is very short because it is an express train and does not stop at any station between Incheon AREX station and AREX Seoul Station. Single-use cards: If you don't plan to use Seoul Subway for the rest of your stay in Seoul, buy this at the Seoul Subway Station Vending Machine or Information Center. T-money cards: If you plan to use Seoul Subway to go to places in Seoul during your stay, T-money card is the best choice. It is a prepaid card that can be purchased at the Subway station or any convenient stores. Nine Tree Hotel in Myeongdong sell T-money card at their reception too. M-Pass: This is the best option for those who want to use public transport intensively in Seoul. You can take up to 20 rides per day with this card. However, it is only commonly sold at Tourist Information Centers, If you plan to get an M-pass, you can get it upon arrival at Incheon Airport at the Seoul Tourist Information Center at Gates 5 and 10 on Level 1 of the Incheon International Airport. Once you have got one of the above ticket card, just hope on to the platform of LINE 4 at Seoul Station. Catch the train that is heading to Hoehyeon Station. Myeongdong Station is right after Heohyeon Station. Do not board the train heading to Sookmyong Women's Univ. Once you are on the train, you are just less than 5 minutes from your final destination: Myeong-dong Station. After leaving Seoul Station, the train will make a stop at Hoehyeon Station before stopping at Myeong-dong station. Here you are, finally arriving at Myeong-dong from Incheon Airport. Myeong-dong station has 10 exits, depends on where you want to go (more in the next section). 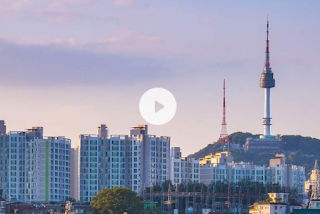 Most people who want easy access to the Seoul Subway will choose to stay at Nine Tree Hotel (150 meters from EXIT 9) or Sejong Hotel (near EXIT 10). An exact guide on how to go from Myeong-dong station to Nine Tree Hotel is available here. That's it. Howe to take an AREX and Seoul Subway Train from Incheon International Airport to Myeong-dong in Seoul. Next up, we will post on taking taxi from Incheon Airport to Myeong-dong. Enjoy your trip to Myeongdong, Seoul! Was thinking about airbnb as our accommodation (maybe for a group size of 10?)! what is your opinion on that? :) Like is korean housing generally nice and well kept etc! So when you were transferring from Seoul Station to Myeongdong station did you have all your luggage with you? Like can you take it on the subway? Thanks for the info. Stil confuse. There has 3 way to reach seoul station. By AREX, COMMUTER & BUS, rite? From Seoul Station to Myeondong?? Sorry for my lack knowledge.. but, is subway that u mentionaboved is bus? Or train? OR another transport? Subway means underground train. In some countries it is called metro or MRT or LRT. Hi Chicken Share, pls advise actually how many train operators are there in Seoul? I am so confused. I read about KORAIL, AREX, KTX and Seoul Metro Subway. Are they run by the same company? And do they serve similar lines or have different purposes?? So if I need to take a train from Incheon Airport to Seoul, which brand or company should I use for taking the transport conveniently?? Thanks to clarify. Yes, you can first take AREX express train from Incheon Airport to Seoul Station. Then at Seoul Station, take Subway Line 4 to Myeongdong. Hope this clarifies your doubt. hi,if i stay in staz hotel myeongdong1, which routes i should takes? Hi. Thanks for your info. I am travelling to Seoul tomorrow and I have booked with Nansam Guesthouse 3. Could you please tell me if I take bus 6015 and where should I alight ? And how can I get to my guesthouse? Hi, my flight will reach ICN at 2230 on Saturday. May I know what options there are for me to get to Nine tree hotel from there? To my knowledge, the last bus and AREX train have already departed by that time. I am afraid you have to take a taxi to Myeongdong. Note that 20% surcharge applies for taxi after midnight but it is not too expensive if you share among a few people. Hi this is really my first time to Korea and I chose Seoul to be my first visiting place as so many people recommended it. I am now planning for my 11-night accommodations in Seoul from end Oct to Nov, so pls advise me if I should book a hotel in Myeongdong area or nearby Seoul station??? Is it not very convenient if I stay nearby Seoul station, especially when I am the sort looking for late night suppers. Because I found a place called K-Seoul Hostel which I feel like booking it but don't know if it is alittle out of way. Thanks to reply ASAP. If you like to have a lot of street food and restaurants around your hotel, perhaps you can try these 2 hotels in the heart of Myeongdong. The price is similar to K-Seoul Hotel. They are very near to Myeongdong Subway station too where you can catch a subway train to everywhere else in Seoul. You can take Airport Bus 6015 from Incheon Airport straight to Myeongdong Station where these 2 hotels are located. Hi Chicken Share, thanks for your fast reply! I will go check it out 2 hotels you've recommended. Pls help me check one more time is it K-Seoul Hostel is located at a quite deserted area and not really near Seoul Station as some reviews mentioned which I have read online??? And lastly pls also advise does street food hawkers usually close early in end Oct to Nov as the weather starts to turn colder?? K-Seoul Hostel is about 5-10 minutes walk to the Seoul Station (main train station in Seoul). The location of the K-Seoul Hostel is not as happening as Myeongdong shopping district. If you want a quieter place to stay, it will be good. As for street food hawkers in Myeongdong, many of them operate until usually operates till around 10pm. It is the same in October and November because Myeongdong remains very happening throughout winter season. Sometimes, it is not yet very cold in October and November. Enjoy your trip to Seoul! Hi Chicken Share, you're indeed a helpful person and I really appreciate your replies. I have just booked an accommodation in Myeongdong area nearby, actual distance to Myeongdong station is unclear. Anyway I am longing for a cool or cold holidays but seems like you've mentioned Oct & Nov is not cold yet, can I roughly know if the temp will be approx 23 Deg C (Daytime) and 10 Deg C (Night time)???? Should I need to bring a thick coat (50% wool made) along with me at before I depart???? Thank you for your compliment. October and November are usually the changing time into winter. Day time can be 20 degree to 10 degree in worst case. Night time can be 10 degree to near zero it winter is here early this year. If it is too cold for you, there are plenty of nice coat and winter wear to buy in Seoul. Hi Chicken Share, once again I thank you for your prompt reply. You speak really good English in my opinion, easy to understand and can communicate well. Anyway I am a little disappointed because I was looking for cool temps like 10 Deg C in the Daytime and maybe 3 Deg C in the Night time in Seoul. But I have booked my trip at end Oct until 1st week of Nov, so I believe the temps in the daytime will not be cool enough like you mentioned it will be 20 Deg C only. So maybe I don't need to bring thick coat with me this time, especially when my spouse & I will be traveling most of the times during the day. It will be just cooling, no need to wear a thick coat to keep warm, unless we travel till late night. I hope I can travel in a cooler temp next time I come to Seoul again, I think I will book in Dec and Jan in future. But my question is will the street hawkers usually close early during this super cold winter season (Dec to Feb)????? The arrival of winter and temperature at end of October are different slightly every year. If you are lucky, you may enjoy cold temperature you wish when you are here. Don't worry, Myeongdong remains super lively and full with visitors throughout winter nights. Towards December, it is even more lively and busier with Christmas lighting and shoppers even through it is colder. I wil stay at king Kong hotel MYEONODONG, which is d easy n economics to get there without any hassle from Incheon international airport? Take bus 6015 or train? Hi! Thanks for the info. I will stay at 24 Guesthouse Namsan duting my trip later. Can you assist me how to get there? Hi may I ask how i can get to gwanghwamun square from myeondong station? I was planning to take the hop on/off bus from there so i can have a tour of the city. From Myeongdong Station, you can take subway train to Chungmuro Station (1 Station away) and then change to Line 3 at Chungmuro Station to go to Gyeongbokgung Station which is located next to Gwanghwamun square. what exit no. at gyeongbokgung station? does it cost more to take a taxi? Thanks you so much for your response :)) I can't find there info in Google. and another question please. Do you think this is legit? I am stay hotel 7 at myeongdong how to go from incheon airport to my hotel. You can take AREX train followed by subway to Myeongdong Station as suggested in this post. After arriving at Myeongdong Station, take EXIT 4 to go to the ground. After getting out of the station from EXIT 4, turn into Toegye-ro 16-gil and walk to the end of Toegye-ro 16-gil before turning left into Sogong-ro 6-gil. Myeongdong 7 Hotel is just shortly after turning into Sogong-ro 6-gil. The walk from EXIT 4 of Myeongdong Station to Myeongdong 7 hotel is about less than 300 meters. Great guide here. I would like to ask if the airport bus 6002 allows me to get off at Ewha Womans University and then get on it again to continue my journey to Jogno2-ga? Yes, but very expensive because you need two tickets. I think it is cheaper to to take subway from Ewha Womans University to Jongno 2-ga. You can consider about subway. Hi, i am staying at philstay. What is the nearest exit from subway station? Many thanks. I hope you are referring to Philstay Myeongdong which is now known as Step Inn Myeongdong. Just take EXIT 8 after arriving at Myeongdong Subway station. Hi, just wonder, if I use AREX line and get Line 4 to Myeongdong station, is it comfortable to bring heavy luggage? It is comfortable to use AREX if your luggage has wheels / rollers for pulling because you need to walk about 5 minutes to LINE 4 platform at Seoul Station. 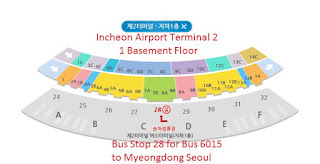 Another option is to take bus 6015 at Incheon Aiport which bring you directly to Myeongdong. The fare is only slightly higher than AREX. hi may i know if the transfer between arex line at seoul station to line 4 involved only escalator? i supposed there is no stairs involved? can we take elevator to avoid use of escalator? We will be arriving Incheon Airport around 6am & our check-in is at 3pm. We are planning to take the Airport Railroad All Stop Train instead of Express Train(AREX)or Bus 6015 to Myeong-dong Station. Understand the cost will be 4150 KRW for Airport Railroad All Stop Train & 1250 KRW for Subway from Seoul Station to Myeong-dong Station. Beside the 5 minutes walk from Station to Station & the stairs at subway stations, is there anything we should be aware of? If you are staying in a hotel in Myeongdong area, you can just drop your luggage at the hotel and enjoy shopping or sight-seeing in Myeongdong before coming back to the hotel later when your room is ready. For Myeongdong subway station, there are many exits to the ground, you may want to find out which exit is nearer to your hotel to safe some walking. Hi. Btw we can still use seoul station lockers to keep our luggage . Am I right ? Yes, you can use the lockers there at a charge or try to use the free locker at Lotte store if you can find it. can you share more about this free locker at lotte store?thanks! How to go PJ hotel from Myeongdong subway station ? I shall be travelling to Jeonju upon arrival into Incheon. I believe I have to take the AREX to Seoul, subway to Yongsan and then take the Korail to Jeonju. Is there another alternative way to Yongsan? Do I need to buy in advance Korail tickets to Jeonju or can I buy on-site at Yongsan Station? If i reach Incheon Airport by 9:40pm and last train depart 9:30pm. Means i only can take airport bus to Myeong Dong? If you are going to Myeongdong, you can take bus 6015 at Incheon Airport too. The last bus is 10.50pm. HI my flight is 8:55am 19 March, I planning to stay at Nine tree, should I check out on 18 March and take the latest 6015 to ICN airport, then sit there for overnight instead of pay one more night but only sleep couple hours? and also I afraid I will miss the flight too. but I'm taking my 16 years old daughter and 80 years mom with me, any suggestion? and any hotel near by? because Nine Tree is little over budget, but I don't want to old hotel, I also check the Rian hotel which price is good but is it convenience? do they have Airport bus to ICN airport? my friend told me Myeong Dong is the best place to shop around. For Rian Hotel, you can take bus 6002 and get off at Jong-no 3 ga Station and walk about 150meters to the hotel. The bus stop to go to Incheon Airport is opposite the arriving bus stop. However, this hotel is a bit far from Myeongdong shopping district. If you have elderly with you it is advisable to get some place to rest while waiting for flight. There are capsule hotel to sleep Incheon Airport but I do not know the hourly rates. The first bus for bus 6002 to Incheon Airport start at 4.30am so you should have enough time to catch 8.55am flight if you stay in Seoul overnight. Hi, our flight on June is arriving at 9:15 pm is it still possible for us to make it at the last trip of Bus 6015 going to Myeongdong? You're reply would be highly appreciated. Thank you. Yes, the last bus to Myeongdong from Incheon Airport is at 10.55pm. You should be able to clear immigration check point and collect baggages in about 1 hour. Hi. Which is the best exit to get to Koreana Hotel from the Myeongdong station? Would greatly appreciate your help. Thanks! Hi,may I know is myeongdong station exit 1 is it far away from Prince Hotel? It is not far but if you are going to Prince Hotel, it is better to exit Myeongdong Station using Exit 2 or Exit 3 where there is escalator. Personally I feel Myeongdong is more suitable if you travel with small kids and old people because you can take airport limousine bus (6015) direct from Incheon Airport to Myeongdong. Early arrival is also not a problem if you stay in Myeongdong area. Just leave your luggage with the hotel (e.g. Ninetree hotel) and you will be free to go for shopping or eating at the many shops/malls and restaurants around the hotel. Shops and restaurants in Myeongdong open around 10am. Thank you Chicken Share. we actually intend to stay at airbnb, near T mark hotel. We couldnt decide, cos there is a lotte Mart at Seoul station that is also attractive to us. Perhaps you can first plan what you want to do and where you intend to go during your stay in Seoul. That will help you in choosing the right place to stay. You may refer to https://goo.gl/5rvMT3 for Seoul itinerary inspiration. Hi I will be staying at Golden tulip M hotel, it said 400 meters from Heohyeon Station. Will bus from Incheon stop anywhere near hotel ? or where is the closet stop to hotel for bus 6015 ? If you take bus 6015 from Incheon, then you should get off the bus at Namdaemun Market bus stop because Golden Tulip M Hotel is near this bus stop. Enjoy your stay in Seoul! Hi, my flight is Dec morning 6.55am arrive Incheon Airport and will take Jeju flight at 6.35pm. Before flight to Jeju, I plan to go Myeongdong exchange money and shop awhile, may I know bus or train which more faster and convenient from Incheon Airport? From Myeongdong to Gimpo Airport by bus or train better? It will too rush? I'm sorry too many questions because I taking my mother along with me. Hope can get your reply, thank you so much! Thank you very much for the reply. May I know 3.30pm from Myeongdong to Gimpo Airport by bus, whether it is catching up with 6.35pm of the flight? You will have less than 2 hours before flight when arriving at Gimpo Airport. Going half an hour earlier may help if there is any unforeseen things happen. What exit do I get off if I stay at Ekonomy Hotel Myeongdong Premier on the way from Seoul station to Myeongong? EXIT 6 of Myeongdong Station will be the nearest to Ekonomy Hotel Myeongdong Premier. Just walk into MYeongdong 8-gil street and turn left on the first cross junction. Hi Chicken share, Its my first time to visit Korea and I will be traveling alone. I'm a bit worries coz Travelers A where I'll be staying at did not provide clear instructions on how to get to their place. I hope you can help me on this. My flight will be in 2 two days from now. 24 Guesthouse Myeongdong Avenue. Thanks. The web is stalled with counterfeit online journals with no genuine message yet the post was fabulous and definitely justified even despite the read.Thank you for imparting this to me. Hello, is it advisable to still take the bus if our hotel is located in Hotel Mido Myeongdeong? Hello.. I planning to go to Seoul on May this year.. and stay at 24 Guesthouse Namsan Garden.. it's Family Trip with 2 Children with ages 7 and 9. Could you advise me if this guest house is best choice to stay? and also I need your help for direction if I using subway from airport to guesthouse. im planning to stay at myeongdong cynosure stido. whats the best way fm incheon airport to this cybosure stido in myeongdong plse. Hi, thanks for sharing valuable information. I have one question, after arriving at Seoul station, If I want to use T-Money to Myeongdong station, do I have to tap it (pay) at Seoul station or from Incheon? You just have to tap it when entering Line 4 subway at Seoul Station and tap it again when exiting at Myeongdong Station. Fare amount will be deducted from your T-Money card when you exit Myeongdong Station.